Poor old mother! This life-sized sitting prop has a foam-filled latex body with metal armature. She has a grey wig and long dress, with hand-painted detailing on her face and hands. 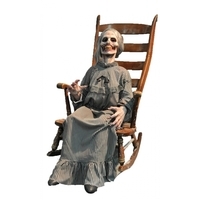 Great static prop for your next haunted scene! Chair is not included-pick up an inexpensive one at your local thrift store or yard sale!